Karl Heinz Martin started his theatre career as an actor in Mannheim, Frankfuirt am Main and Hamburg. In 1918 he went to Berlin, where he co-founded the Theater am Knie (later the Tribüne) with Rudolf Leonhard. There he succesfully staged Ernst Toller's "Die Wandlung". He worked at the Kleinen Schauspielhaus and the Theater am Nollendorfplatz in Berlin and at the Volkstheater and the Raimundtheater in Vienna. In 1928 he was the director of the Volksbühne in Berlin-Mitte. In 1920 he made the expressionist movie "Von morgens bis Mitternacht" and it was followed by several more movies. After the nazi's came to power he was hardly able to work in the theatre and he concentrated on movies without any political messages. On August 15, 1945 he re-opened the Hebbeltheater with Brecht's "Dreigroschenoper". 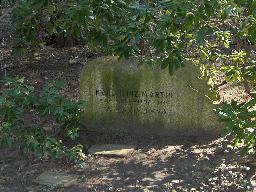 The grave of Karl Heinz Martin at the Friedhof Heerstrasse, Berlin.